Is your business MTD-ready? Find out how MTD will impact you. Making Tax Digital (MTD) is the Government’s plan to transform the tax system by moving it online. MTD will affect VAT registered businesses from April 2019. MTD for income tax and corporation tax is expected to follow, but not before 2021 at the earliest. 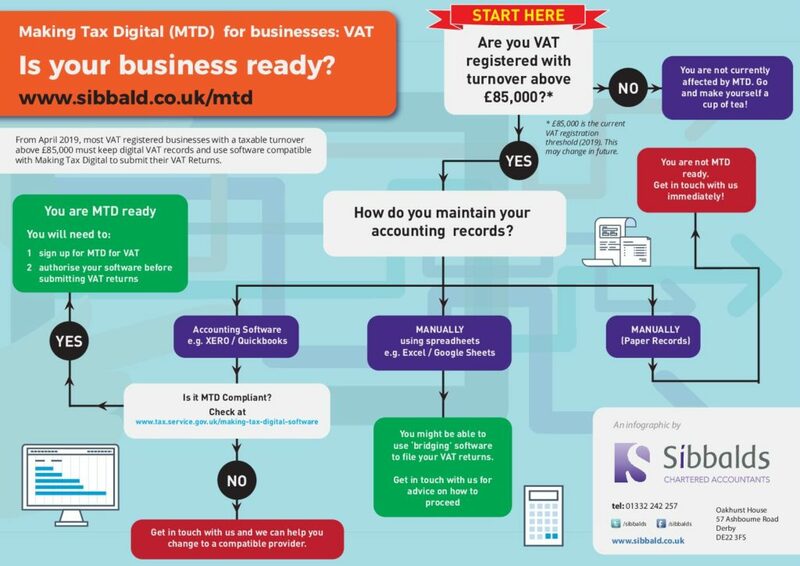 Use our MTD flowchart to check if MTD applies to your business. HMRC has published detailed advice for businesses on whether they need to follow the rules for Making Tax Digital for VAT. Once you are sure you can be compliant you need to sign up for MTD with HMRC. Please note that if you are a business that pays VAT by direct debit you cannot sign up in the 15 working days leading up to, or the 5 working days after sending a VAT Return. Click on the following link and scroll down to “Sign Up Your Business”: Sign up for Making Tax Digital for VAT. Please note you will be asked to confirm that (i) you have accounting software for managing your VAT records, and, (ii) your software is ready to submit your Making Tax Digital for VAT Returns directly to HMRC. You will then be prompted to log into your government gateway account and be required to answer a few questions including what is your company number and what is your email address before being asked to agree to the terms of participation. Once submitted you’ll receive an email within 72 hours to confirm that you can submit returns using software that’s compatible with Making Tax Digital for VAT. Please note after you’ve signed up, you cannot use VAT online services to send VAT Returns. Before you can send VAT returns, you’ll need to authorise your software. In the Financial Settings section, click Accounting Dates & VAT. Scroll down to the Making Tax Digital section, then click Authenticate. Select the I am signed up with HMRC for Making Tax Digital check box, then click Authenticate. The GOV.UK website opens automatically. To allow permission for Sage to interact with HMRC on your behalf, click Continue when prompted. Sign in with your Government Gateway credentials. When prompted, click Grant authority. Once successfully authenticated, a prompt appears in Sage Business Cloud Accounting to indicate this. The authentication lasts for 18 months, after which time you’ll then need to re-authenticate again. The next time you go to “Create your VAT return for HMRC”, it will submit under the new MTD system. Click Settings then click Company Preferences. Enter your password then click OK and click the VAT tab. Click the Enable Making Tax Digital for VAT submissions check box, then click OK. When you next submit your VAT return it will submit under the MTD for VAT pilot. Please do not hesitate to contact us if you need help doing this or indeed have any further questions.